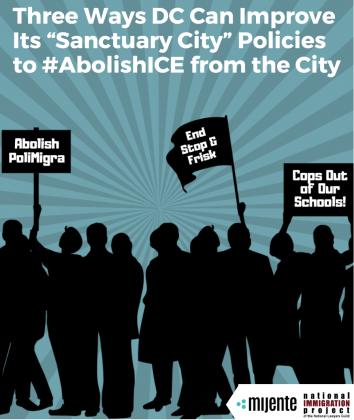 Today, Mijente and the National Immigration Project of the National Lawyers Guild (NIPNLG) released a new report, Three Ways D.C. Can Improve its “Sanctuary City” Policies to #AbolishICE from the City, that exposes the ways that D.C. participates in raids and deportations of its community members. The report calls on D.C. officials and community to end its collaboration with Immigration and Customs Enforcement (ICE) as a concrete step towards the abolition of this rogue agency. Washington, D.C. has experienced an increase in raids and ICE transfers in the past year. Community members have been arrested by ICE in their homes, outside of work places, public spaces and directly after being released from D.C. police custody. Communities under attack have been organizing to free their loved ones out of detention. Local immigrant rights organizations like MLOV, BLM DC, Stop Police Terror Project, BYP100 DC, No Justice No Pride, and Sanctuary DMV organized actions to hold officials accountable to the Sanctuary City policies they prided themselves on.These actions raised questions about the lack of accountability to Mayor Bowser’s commitment to protect immigrant communities. Mayor Bowser has declared repeatedly that Washington D.C. is a “sanctuary city” for immigrants, where “neighborhoods are safer and stronger when no one is afraid.” She has also affirmed that D.C. law enforcement, the Metropolitan Police Department (MPD), does not collaborate with Immigration and Customs Enforcement (ICE). But, as this report reveals, the reality for D.C. residents is anything but sanctuary or safety. The D.C. jail, operated by the city’s Department of Corrections, has a policy of collaborating with ICE by transferring individuals into ICE custody upon resolution of their criminal matters, such as after they are granted pretrial release, their charges are dismissed, and/or they serve their sentence. The Metropolitan Police Department (MPD), D.C.’s local police department, has several ways it facilitates deportations of community members, directly and indirectly. At the D.C. Courthouse, the U.S. Marshals, a federal law enforcement agency, are detaining individuals in the D.C. courthouse holding cell and releasing them to ICE at the end of the day. D.C.’s pretrial services and probation programs are staffed by a federal agency called the Court Services and Offender Supervision Agency (CSOSA) that collects immigration status information and collaborates with ICE. Close the loopholes in the D.C. 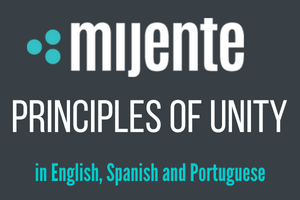 Jail policy which allows the jail to notify and transfer individuals to ICE, in circumvention of the city ordinance limiting the jail’s submission to ICE detainers. This means a policy that clearly prohibits ICE transfers, notifications, and access to the jail. End MPD policies and practices that over police and criminalize people of color in our schools and communities: this includes ending stop and frisk policies, gang database and labeling practices, over reliance on school resource officers to address school discipline, replacing school resource officers with more social workers. Cancel the use of U.S. Marshals as D.C. Courthouse Bailiffs and end the federalization of D.C.’s criminal legal system. Three Ways D.C. Can Improve its “Sanctuary City” Policies to #AbolishICE from the City lays out the policies and actions that are harming our communities in D.C. This is a report to use as a tool to push for policy changes that create a safer city for all its people. We will continue to fight for our communities in Washington, D.C. until we #AbolishPoliMigra from the city.